The changing composition of the atmosphere affects both regional air quality and global climate. Measurements and model simulations aim to better understand the distribution and impacts of trace gases, aerosol components, and cloud- and rainwater composition. 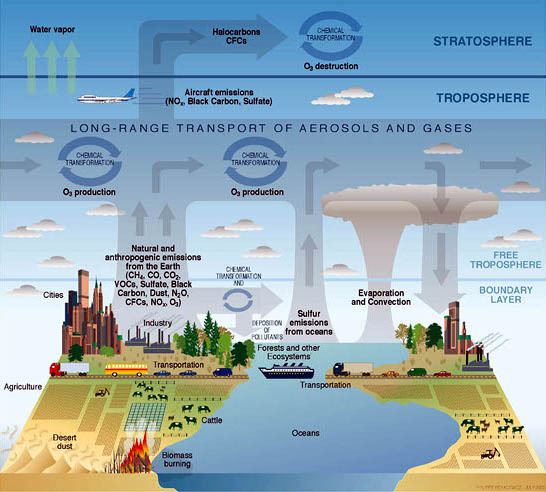 Process studies focus on aerosol formation from gases (gas-to-particle conversion), impacts of climate change and pollution on the self-cleaning efficiency of the atmosphere, cycling of nitrogen oxides, and ozone deposition to ocean waters. We are using aerosol mass spectrometry for high time resolution measurements of size resolved aerosol composition and, starting in 2009, chemical ionization mass spectrometry to monitor atmospheric OH radicals, gaseous sulfuric acid, and other compounds at < ppt levels. Rosenfeld, D., U. Lohmann, G.B. Raga, C.D. O'Dowd, M. Kulmala, S. Fuzzi, a. Reissell, M.O. Andreae, Flood or Drought: How Do Aerosols Affect Precipitation?, Science, 321, 1309-1213, 2008. Rohrer, F., and H. Berresheim, Strong correlation between levels of tropospheric hydroxyl radicals and solar ultraviolet radiation, Nature, 442, 184-187, 2006. O'Dowd, C.D., M.C. Facchini, F. Cavalli, D. Ceburnis, M. Mircea, S. Decesari, S. Fuzzi, Y.J. Yoon, and J.P. Putaud, Biogenically-driven organic contribution to marine aerosol, Nature, doi:10.1038/nature02959,. 2004. Lelieveld, J., H. Berresheim, S. Borrmann, P. J. Crutzen, F. J. Dentener, H. Fischer, J. de Gouw, J. Feichter, P. Flatau, J. Heland, R. Holzinger, R. Korrmann, M. Lawrence, Z. Levin, K. Markowicz, N. Mihalopoulos, A. Minikin, V. Ramanathan, M. de Reus, G. J. Roelofs, H. A. Scheeren, J. Sciare, H. Schlager, M. Schultz, P. Siegmund, B. Steil, P. Stier, M. Traub, J. Williams, and H. Ziereis, Global air pollution crossroads over the Mediterranean, Science, 298, 794-799, 2002. O’Dowd, C.D., J.L. Jimenez, R. Bahreini, R.C. Flagan J.H. Seinfeld, L. Pirjola, M. Kulmala, S.G. Jennings, and T. Hoffmann, Marine particle formation from biogenic iodine emissions, Nature, 417, 632-636, 2002. O’Dowd, C.D. P. Aalto, K. Hämeri, M. Kulmala, and T. Hoffmann, Atmospheric particles from organic Vapours, Nature, 416, 497-498, 2002.